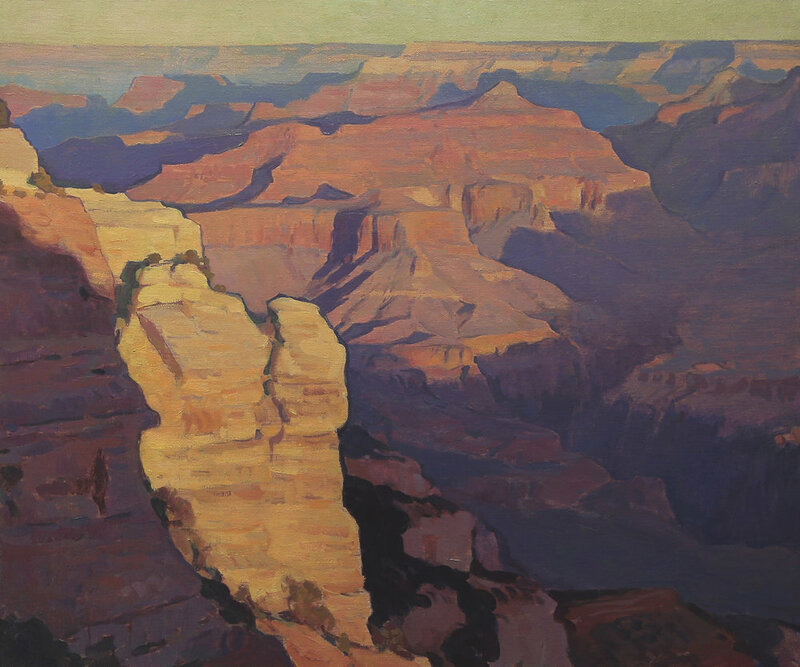 Historically a mecca for natural grandeur, the Grand Canyon has been interpreted countless times by artists seeking to capture its beauty. 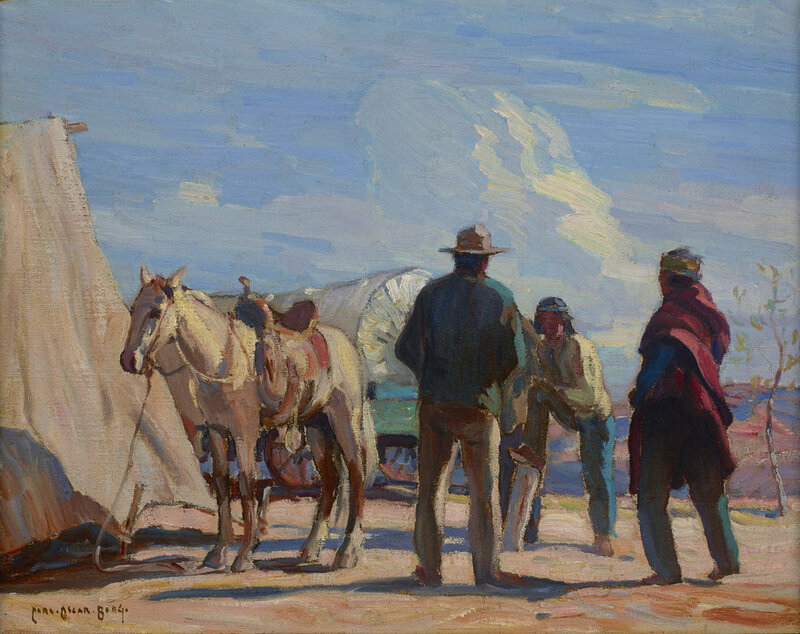 Artists like Carl Oscar Borg to W. R. Leigh focused on this location in their historic works. 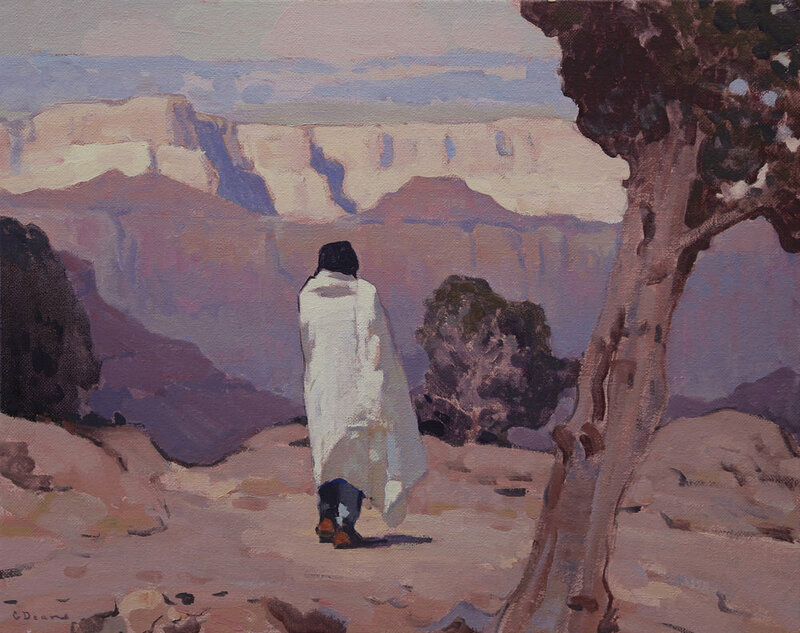 In a more modern narrative, Maxwell Alexander Gallery’s Grand Canyon exhibit allows artists the opportunity to give a contemporary voice to express this iconic location. For artist quotes and show installation photos, scroll to the bottom of this page. 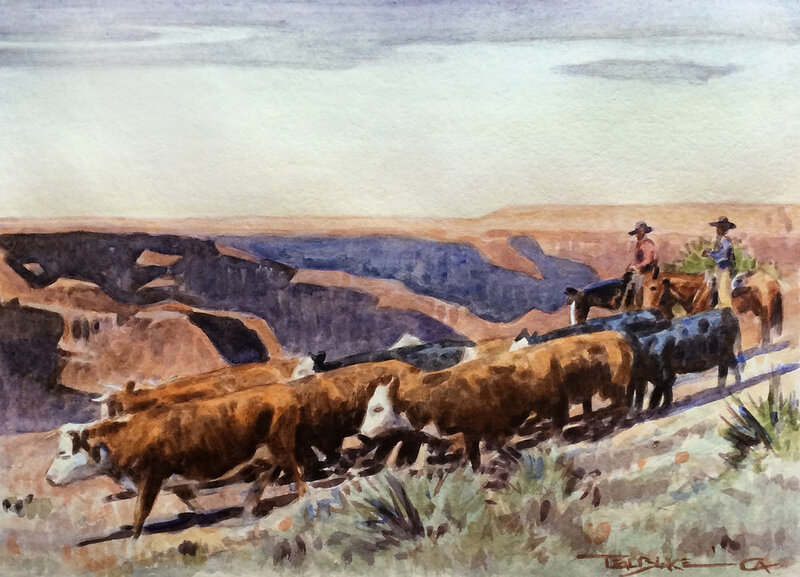 G. Russell Case: When I am at the Grand Canyon I am always taken back with the endless feel of distance. The painting I have done is about a very small piece of this but I wanted to suggest the fact there is much more going on out side the painting. 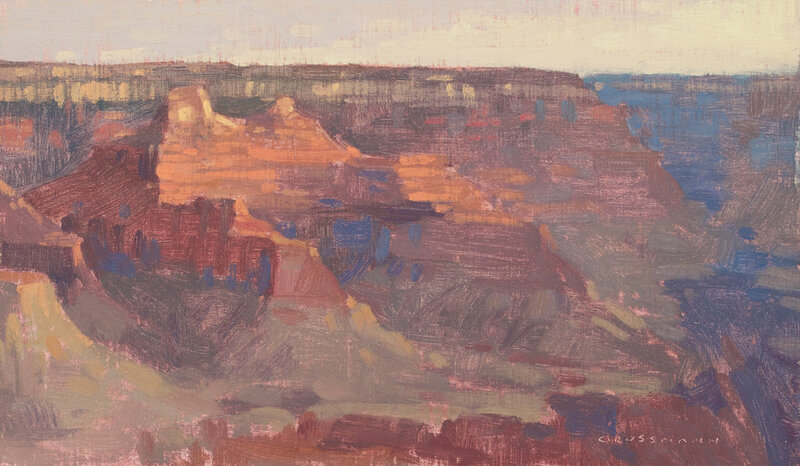 David Grossmann: Standing on the canyon rim gives me the feeling that I am flying and falling at the same time. When I look far across to the other side, first I notice the flat stillness of the horizon line. Then, as I look farther and farther down the layers of earth, I watch as the lines leave their stillness and become more and more curving, gracefully turbulent, until at last I finally glimpse the twisting green river far below. 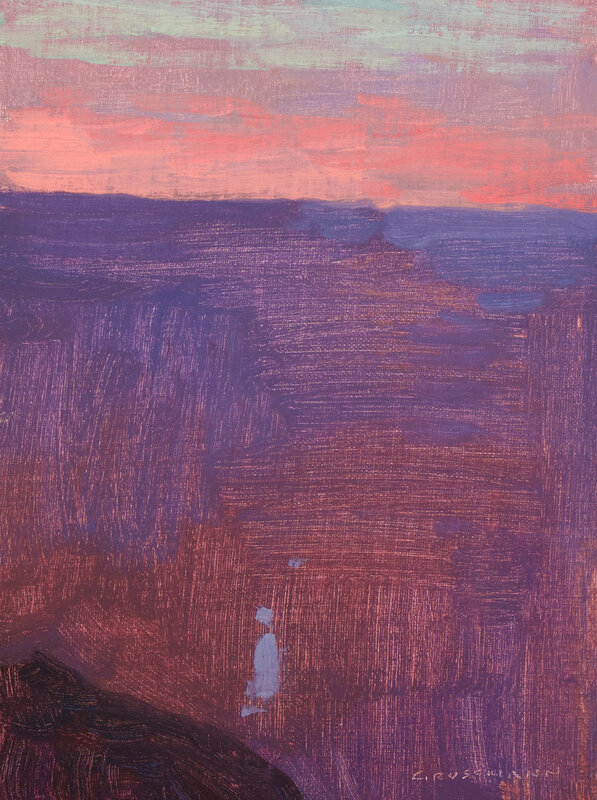 Bryan Haynes: I like to tell stories with my paintings, and to give a sense of Regionalism by placing figures in a landscape. 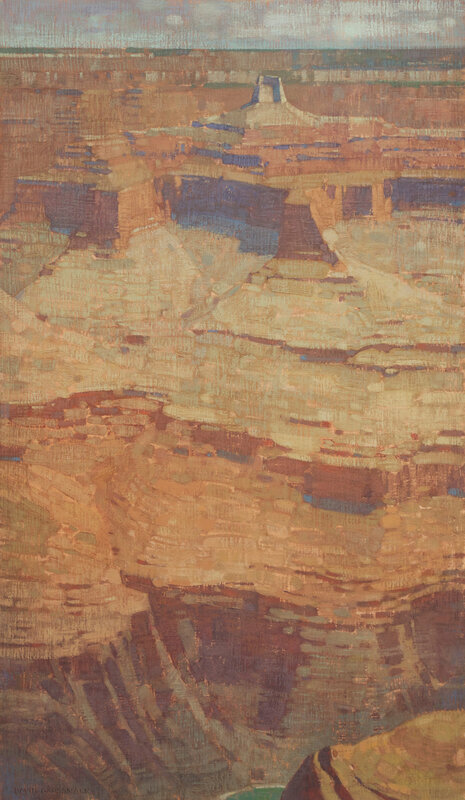 "Grand Canyon Havasupai" depicts the vast depth of the Grand Canyon while simultaneously suggests the flatness and beautiful design of a Navajo weaving. 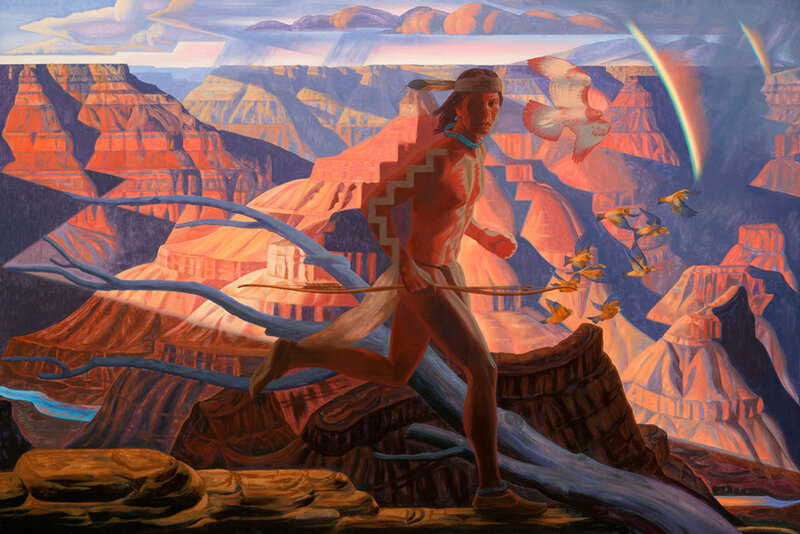 The painting pays homage to the history of the Native Americans, the Havasupai who have lived in the Canyon for more than a 1000 years, with a figure integral to the landscape: he looks out at us - directly at the viewer. So, I wonder what emotions might be elicited from people who view the painting. Brett Allen Johnson: This canyon, it's too great, too vast; it's incomprehensible. Pigment and canvas can't get that, and so all that's left is to make something else of beauty as a reminder. Mark Maggiori: "I discovered the Grand Canyon when I was 15 years old. It was a shock and I will remember the feeling forever. I waited a bit more than 20 years before I returned. And the second time was even more striking. Ever since then I’ve often, to dream, observe and paint. There is no place like that on earth. The Grand Canyon is mystical, mighty and majestic. Observing the light changing from sunrise to sunset is such an enlightening experience. It makes you forget about everything else and imagine that you are all alone and in total bliss." 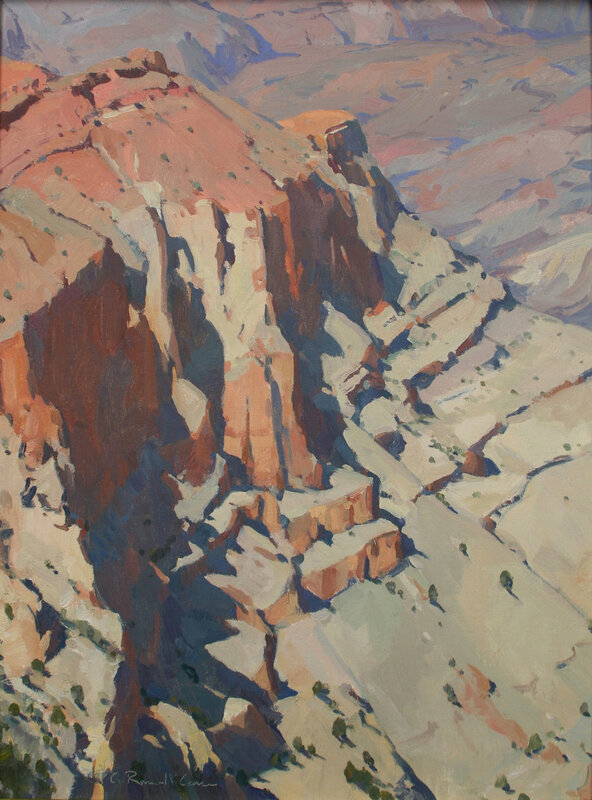 Ray Roberts: "it seems every moment offers a different painting at the Grand Canyon, from the south rim. This painting gives the viewer a small glimpse of the river in mid-morning light. Horus Temple sits prominently above the river set in the grandeur and depth of this magical place."